Jean-Pierre Melville was the master of the drame azur; those strange, dark films, usually French, that contrasted such dramatic darkness with often very light visuals of a bluish hue. The light was still murky, creating bluish white-outs with cloud, fog, sea and other natural elements playing into the blurring of the image. But the drama was predominantly daytime, often making crime films especially seem refreshing from their often night-based leaning. I often now think of the opening Alain Corneau’s Série Noire (1979) (or even several moments from Le Choix des Armes, 1981), Chantal Akerman’s Les Rendez-vous d’Anna (1978), and most of Marguerite Duras’ shoreline based dramas (especially Agatha and the Limitless Reading and L’Homme Atlantique). But Melville’s films managed perfectly that icy mixture of crime in particular and blue washouts, never bettered than in the opening segment of his final film Un Flic (1972). The film uses this aesthetic to create tension (as well as an icy melancholy) but the effect is more startling than simply another way to crank up the criminal ante. More than anything else, this use of colour aesthetic made me unusually consider the colour theories of the French architect Le Corbusier, such is its thematic power in Melville’s film especially (it is telling, however, how all of the films mentioned above do play with filmic space in interesting and various ways). Un Flic follows a group of thieves having had a shaky start to their first bank heist, now planning their second. The film is relatively straightforward in narrative terms but Melville breaks apart the medium in slick and subtle new ways of portraying the noir clichés. The sense of drame azur is most apparent in the first heist which takes up most of the film’s opening. Melville presents the viewer with a lightening quick array of blue-white images: white cranes in a blind sky, a wave crashing down into foam, a gull hovering under the clouds. He cuts from this array of images to a block of seaside buildings, incredibly uniform and white, but all tinged with a light blue. The viewer is following a black car which eventually cuts through the haze, the titles intercutting between this journey and black title cards. In the car are four men wearing hats; they seem ominous without trying. Melville unusually cuts to Paris, near the Champs-Élysées where we briefly meet Alain Delon’s character charged with eventually stopping the thieves. It’s a strange disjoint and one that could have been avoided though Melville quickly corrects and returns to the tense scene of the driving. The car parks up outside a lonely bank, taking up the corner of the uniform building. No one is around and, most importantly, the colour aesthetic is isolating the building. The roads could lead to nowhere and anywhere, the shoreline opposite may or may not be there. It’s a stunningly eerie realisation for a noir film set here in the daytime. The men then get out one by one, enter the bank, botch the job, and escape with only some of the money, one of them having being injured by an ambitious bank clerk. It’s all brilliantly realised, the inside of the bank feeling almost like an outpost in the middle of nowhere though containing several customers to add contrast. Thoughts of Le Corbusier first arose from the building used in the shot itself. 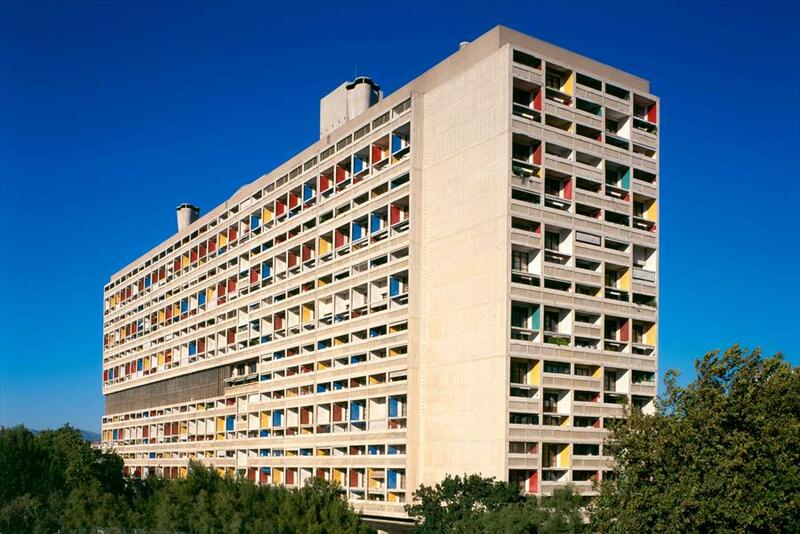 The building, which are the beachfront apartments in Saint-Jean-de-Monts, Vendée, resemble nothing less than the Unite d’habitation in Marseille that Le Corbusier designed with the help of Nadir Afonso in 1952. The building’s formal design is broken up by blocks of primary colours, arranged in very specific orders according to the designer’s preference for what contrasts worked best. These colours were organised via a special key-hole system developed much earlier that used a piece of card to allow colours to occupy one small space in between. The idea being, when applied to architecture, that such combinations of colour psychologically effect the perception of the space, with certain colours drawing the eye more, others complementing certain lines or alcoves. Melville’s building, however, has none of this, reflecting what the overall colour scheme of the film actually creates; a removal of lending the eye a hand. The mass of blue-white seems to become part of the natural surroundings, the lack of people further hinting that the space is strangely part of the wider ephemeral surroundings: sky, crane, gull, waves, building, fog. What effect does this have on the drama? Aside from the previously mentioned tension, the feeling that the dangerous robbers could easily vanish into the ether is built by this white-out. They might as well rob a bank in the middle of a forest; the space will protect them. The whole aesthetic plays with a problem that Le Corbusier was trying to solve, fading everything together until it is simply a range of shapes that benefit those who require getaways and disappearances. Such light colouring, these white-blue hues, were the sort of atmospheric tones that the designer used in order to materialise boundaries of space whilst also trying not to ultimately restrict such space, what he would sometimes label as “transitional” pigments or colours. The drame azur is the mise-en-scène equivalent of Le Corbusier’s transitional colours (which also explains why many of the earlier films mentioned follow characters that seem to be in some way disappearing). 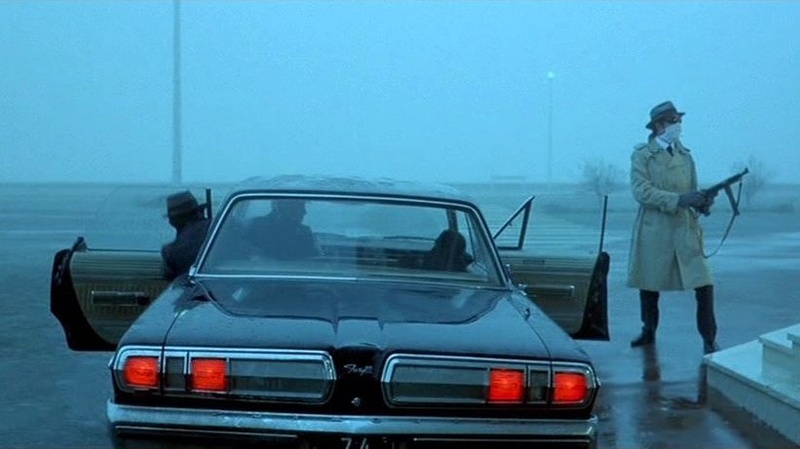 In Un Flic, the colour palette only partly materialises such boundaries; the space is left opaque, unrestricted and endless, the criminal car disappearing into the white-blue air soon to cause more mayhem when it emerges in more solid surroundings.